Tragedy struck in the hilly town of Oka-Akoko,headquarters of Akoko Southwest of Ondo state on Saturday when four petroleum tankers burst into flames due to difficulties in ascending the elevated terrain of ‘Oke-Oka’. 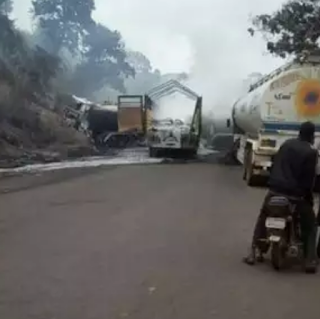 As at the press time,the inferno still subsided,while motorists have abandoned the route linking Owo-Iwaro-Isua-Akoko-Lokoja- Abuja. The Mokwa-Jebba bridge collapsed few weeks ago causing untold hardship to motorists and passengers. According to the Olubaka of Oka-Akoko, Oba Adebori Adeleye, the present situation had ruined the economy of his people and had adverse effect on their lives. However,the monarch appreciated Governor Oluwarotimi Akeredolu for his concern following the prompt delegation he sent to assess the road. Already, officials of the Federal Road Safety Commission(FRSC) and soldiers have flooded the road to control few vehicles and motorcycles plying the dangerous spot. The volume of articulated vehicles passing through Ikare-Ajowa to the Northern part have increased tremendously and now spoiling the road. Residents of the four local government areas in Akokoland accused their representatives at both State and National Assemblies of not doing enough to tackle the road in the area in spite of many lives that had been lost because of the development.